3g of protein for only 27 calories, and they taste like cookie dough! These bites were the delicious protein-packed saving grace I didn’t know I needed. And so began a dynasty. I whipped up these beauties late one evening in an impulsive pursuit for the perfect midnight snack. Love at first bite does not begin to do this experience justice. Blown away by that fateful first taste, I have since riffed on these protein bites in every key I know. (When translated from the language of bad music jokes, this means that I’ve remade these bites in every flavor known to man and Pinterest). Ask me about them and my eyes light up. Muse about their macros and I’ll talk your ear off. I’m also her favorite daughter. But what can I say? Competition is stiff when you’re an only child. When it comes to your daily routine and recipe arsenal, these bites will be the saving grace you didn’t know you needed. As long as you know what you’re doing. But I’ve got your back (as always because I love you), so let me walk you through this. The good news is that you can use whatever protein powder your hungry heart desires! With that in mind, because protein powders vary so much in texture and ability to hold liquid, you’ll need to add in the almond milk one tablespoon at a time, mixing thoroughly between each addition and stopping when you’ve reached a cookie dough texture. 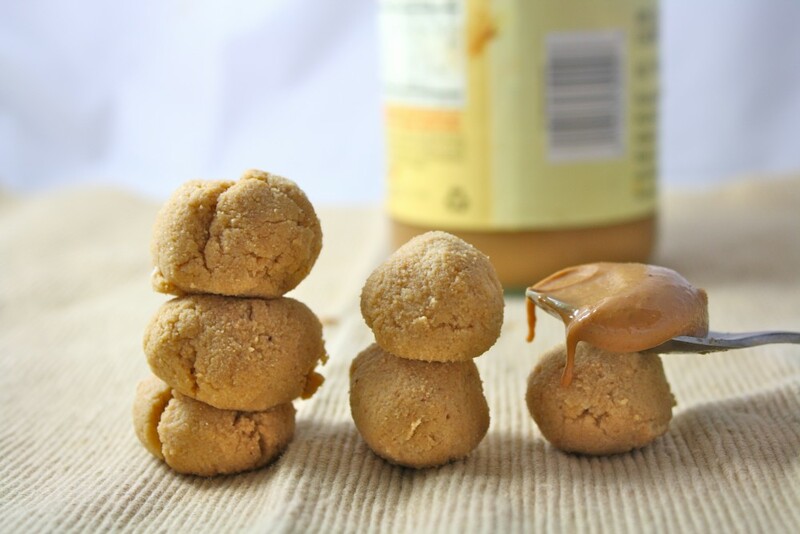 Regular peanut butter results in a substantially firmer dough than powdered peanut butter, and it also tends to yield more volume and thus more bites. I personally am on a higher fat diet and love using regular peanut butter in this recipe. However, if you’re restricting your fat/caloric intake, PB2 might be the best way to go, so I want to give you that option. That being said, I do really enjoy using PB2 with SunWarrior, and do it all the time when making my single serving protein cookie dough. Just be wary if you use whey protein and powdered peanut butter, as the dough can easily become runny if you’re not very careful when adding the almond milk. Obviously you will end up using slightly more if you use powdered peanut butter instead of regular peanut butter, as peanut butter is wet but the powder is dry. Note that the addition of coconut here does help firm up the texture though. Using a heaping 1/2 tablespoon measure (or whatever size you want), roll the dough into balls. At this point, I place the balls on a parchment lined baking sheet where I stick them in the freezer, freeze until cold, and transfer to a zip-lock bag for long term storage. If your bites end up being too runny, storing them in the freezer will 100% solve that, and you’ll now have a delightful frozen treat! Again, the texture of the finished bites will depend on what type of protein powder you use and whether you use regular peanut butter or powdered. In my experience, vegan protein powders (such as SunWarrior, which I adore) are best able to hold liquid and thus result in the firmest end product. Whey/casein blends tend to be a close second, and plain whey protein tends to be the worst when it comes to absorbing liquid. Also keep in mind that the yield can vary greatly depending on which ingredients you use. Using peanut butter with a protein powder that absorbs liquid well, such as SunWarrior or Quest, will result in significantly more bites than ingredients that don’t hold liquid well, such as whey protein with powdered peanut butter. I’ve gotten as few bites as 24 and as many as 40. I used 30 as a reasonable average to calculate the calories. If you’re particularly concerned with calories I assumed that you want the calories to be as low as possible, I also calculated the nutritional information with PB2. Now that I’ve given you a novel on what ingredients to use, please make these bites and devour. In a large bowl, combine protein powder, peanut butter or powdered peanut butter, erythritol, and vanilla extract and stir until completely combined. If using regular peanut butter (and not powdered), use your fingers to knead the dough, ensuring that the dry ingredients are incorporated into the peanut butter as well as possible. Now here comes the part where you really have to pay attention. Because protein powders vary so much in texture and ability to hold liquid, add in the almond one one tablespoon at a time, mixing thoroughly between each addition and stopping when you've reached a cookie dough texture. Obviously you will end up using slightly more if you use powdered peanut butter instead of regular peanut butter, as peanut butter is wet but the powder is dry. Stir in the shredded coconut and chopped dark chocolate. 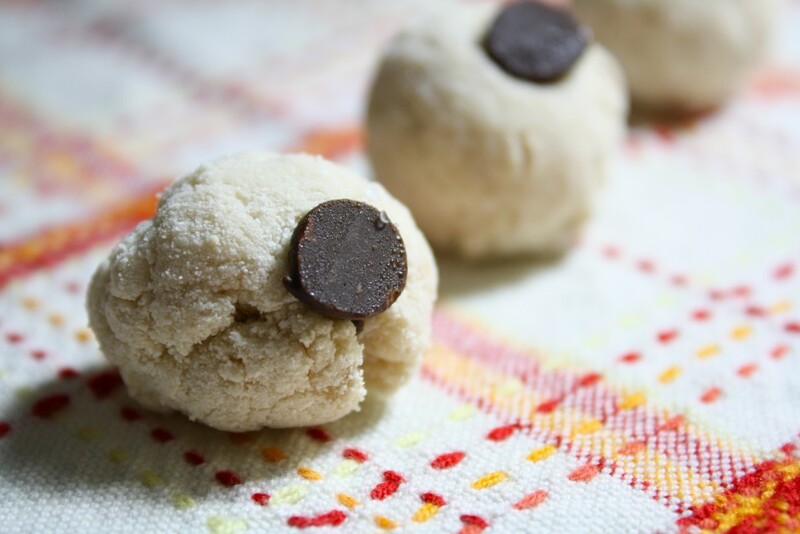 Using a heaping ½ tablespoon measure, roll the dough into balls. At this point, I place the balls on a parchment lined baking sheet where I stick them in the freezer, freeze until cold, and transfer to a zip-lock bag for long term storage. Again, the texture of the finished bites will depend on what type of protein powder you use and whether you use regular peanut butter or powdered. In my experience, vegan protein powders (such as SunWarrior, which I love) are best able to hold liquid and thus result in the firmest end product. Whey/casein blends tend to be a close second, and plain whey protein tends to be the worst when it comes to absorbing liquid. 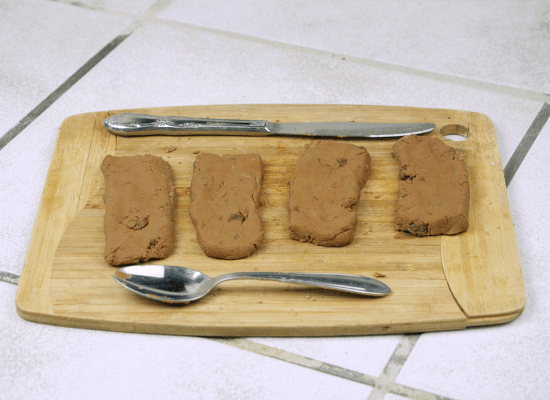 Regular peanut butter results in a substantially firmer dough than powdered peanut butter, and it also tends to yield more volume and thus more bites. I personally am on a higher fat diet and love using regular peanut butter here. However, if you're restricting your fat/caloric intake, PB2 might be the best way to go, so I want to give you that option. Just be wary if you use whey protein and powdered peanut butter, as the dough can become runny if you're not very careful when adding the almond milk. The addition of coconut here does help firm up the texture though. I actually really enjoy using PB2 with SunWarrior, and do it all the time when making my single serving protein cookie dough. Now that I've given you a novel on what ingredients to use, please make these bites and devour. Which other flavors of these would you like to see? Spoiler alert: I’ve got red velvet and brownie batter coming your way! « Flourless Almond Butter Brownies + An Announcement!